Also in 2016, in a transaction that brought me a couple of other coveted bottles, my brother muled me a couple of samples of Blanton’s Straight From the Barrel that were purchased at Master of Malt. Around the time that I got those bottles and the sample to @paddockjudge he was kind enough to provide me with a sample of the Original which would be my first taste of that expression. On September 2, 2018, at last, we did a video tasting of the Original, Gold, and SFTB. Kraft Caramels, cherry, rich nose. Some fine ground black pepper, and butterscotch peeking through. Sweet Golden Delicious apple. A bit spirity. Feels like the hairs in my nose are being burned off. Rich, powerful sweet and hot arrival. Spicy, oaky. Lots of caramel and vanilla. Water has minimal effect on taming this. Quite delicious. This is powerful, the nose and the palate complement each other. This is a powerful bourbon. Not A. Smith Bowman, Stagg (+/- Jr) or ECBP powerful, but rich and full-flavoured. This is apparently only readily available in Europe or the UK, and not in North America (which is strange... and sad). Would I buy a bottle of this? Probably…if I could afford it. Nose: Maple syrup, caramel, cherry cola, sweet nose.. Mint, eaculyputs candy, cayenne, cinnamon, nutmeg and cloves of course, took some time before I got the vanilla, lays beneath the thick sweet notes and pointy spices. Apple pie, apple juice, apple hard candy and raspberry candy. Water can make the nose more attainable and gives it a more cognac character on the nose and even more on the palate(a balanced medium sweet cognac), but I like to drink it straight. Palate: Rich and loaded with flavour from the start, the first bourbon where I get a full flavorburst experience right after entering the mouth on the tip of tongue. Flavours translate well from nose to palate. It is never too warm, of course it gets too hot if u take a big sip and/or hold it in ure mouth to long since its 64.8%abv.. But if u adjust ure sips accordingly, its well behaved in the mouth, thick and packed with flavour, quality from start to finish. Its typical bourbon notes, just a richer experience. Finish: In the latter development and towards the finish it reminds me of cognac, cognac spices and fruit notes lay alongside maple syrup, vanilla and butterscotch salt/sweetness. There is also some espresso spices and smoke, and a tone of raspberry bonbon lingering in the roof of mouth. Medium too long finish..
Balance: Sweet/sour, oak and spices, nothing sticks out to much and seems to be in perfect balance. Its pretty sweet on the palate, but counters that with loads of flavour and spices in the development. This was from a freshly opened bottled I tasted at my dads house, think it was bottle 28 from 2013. I will be getting a bottle for my birthday later this year, so a more detailed review perhaps will come for that one..
@ElCocos, thanks for your nice detailed review. 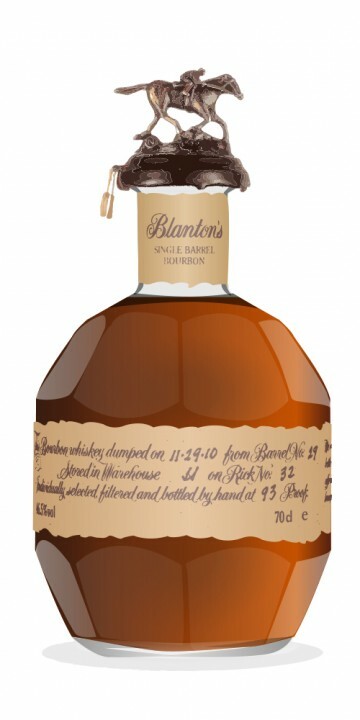 Sazerac Company and Buffalo Trace distillery do not own the Blanton's brand. For whatever reason, the owners of the brand have chosen to sell Blanton's Straight from the Barrel only outside the United States. It is wonderful intense stuff, though! Try some if you get the opportunity. I've had multiple drams from purchased samples, but I finally decided to open one of my bottles. I tried it a few times (down to half a bottle now) and have, more or less, consolidated my notes. Nose: A little peculiar at first this time around (compared with previous pours and other barrels). More wet shaved wood and mint. In the background are toffee, butterscotch, brown sugar. There is a more traditional rye honey richness, which is top-notch. Carmel-coated popcorn and vanilla. Really improves with time in the glass. Buttery, rich, and fat. (with water) More rye grain here, honey, toffee -- generally more earthy and slightly less rich and ethereal. Amazing. And caramel. Palate: Thick and a little warm, no surprise, with a strong sense of the usual honey, toffee, butterscotch, and sweet and candied corn. Vanilla. Really more 'yellow' sweet than 'brown.' The wood keeps it from being a run-away dessert monster, and rye spice in buried in it. (with water) Much more rye and dry, the sweetness here is secondary with darker and earthier notes in the foreground. Finish: A little more darkness from the wood. The dry, dark, bitter chocolate. Honey, rye grain, and all the other flavors. This is like two different, but related, bourbons without and with water. The finish is excellent. The score here is more of a sense than an absolute anything. @numen, none of your usual 'with water added' descriptions? Could it be that you didn't add any? Have you gone over to "The Dark Side" of drinking high ABV beverages without water? I hope so, at least sometimes. Yours is a poetic review. Thank you! @Victor, thanks! I did do this one with water, more for the sake of comparison than anything else. In general, when I drink high ABV spirits for myself (and not with notes in mind), I don't do water at all. With or without water (still probably above 50%), this bottle, and the other drams from the series that I've had, have been spectacular and consistently superb. I loved another incarnation of this expression and was curious to see how it went from bottle to bottle. Nose: Rich rye bourbony goodness. Vanilla, rye spice, and a molasses like syrup or caramel dominates. Wood is there, but completely in check. Cherry liqueuer and apples. Cinnamon and concentrated spice rum. I may use this as an aphrodisiac. (with water) Like the Blanton's at 46.5, but much richer and more vibrant. Buttery honey and toffee, rye and rye candy. Sweet nose. Rich vanilla extract. Heaven is supposed to smell like this. Palate: Thick and syrupy, not surprising given the nose and proof. Initial burst of wood, rye, caramel-honey, and baking spices. Much less fruit. Drop of orange liqueur and burned spice cake. Gives way somewhat to dry bourbony dark chocolate. (with water) still rich and thick. Honey, rye goodness. Lots of goodness in this one. Just a perfect amount of wood. The rye is typical of the sweet and spice. Hard to fault, so I won't. In Ontario we've been able to enjoy Blanton's Original, Special Reserve, and Gold Edition; however, each time numen hints at the magnificent qualities of the cask strength it makes me wonder why we are being punished and not able to enjoy the cask strength...I'd gladly pen a letter. Nose: I can really get on board with this. It smells thick. Maple syrup, almost like an extremely high quality spiced dark/navy rum. Stewed prunes and figs. Heavy, dark caramel covered apples. I'm not going to drink this. It's too amazing. (with water) More fruit comes out, and the water clarifies the deeper notes, if that makes sense. The syrup and spiced are brought into greater relief. It's top-notch. I may prefer this slightly neat, but at this point, it's splitting hairs. Palate: Syrup, maple, wood, spice (cinnamon, cardamom, touch of anise). Unsurprisingly a little warm, but that's a-ok by me. Maybe green apple or apple skins. Just explosive and awesome stuff. Very dense. Not the easiest sipper, but the best things don't have to be. (with water) More honey and straight, obvious rye grain and sweetness. Syrup+pepper, wood, and a great kick still. Finish: Perfectly balanced sweetness with the wood to brace it. It turns a bit to pipe tobacco juice, ashy cigars, maple syrup, and more spiced navy rum in the backyard. Dark cherries, why not? (with water) Rye, wood, sticky syrup -- no trend here -- a bit of heat and pepper. I'm not sure; I wandered into a bourbon induced hazy dream. This is one of those rare bourbons for me that I not only love, but wish that I had bottles of. BOTTLES. @MCM, it's a BT product bottled for a Japanese company and sold only in Japan and Europe. Sadly, it doesn't look like they're going to produce it for the US market. This is different from the Original Single Barrel, which is bottled at 46.5%. I forgot to mention here, but I only had a sample from a friend, though, now, I'm scouring the internet for a bottle somewhere. It's now one of my favorite bourbons. I have no idea why they don't sell it in the US; it'd sell like hot-cakes.